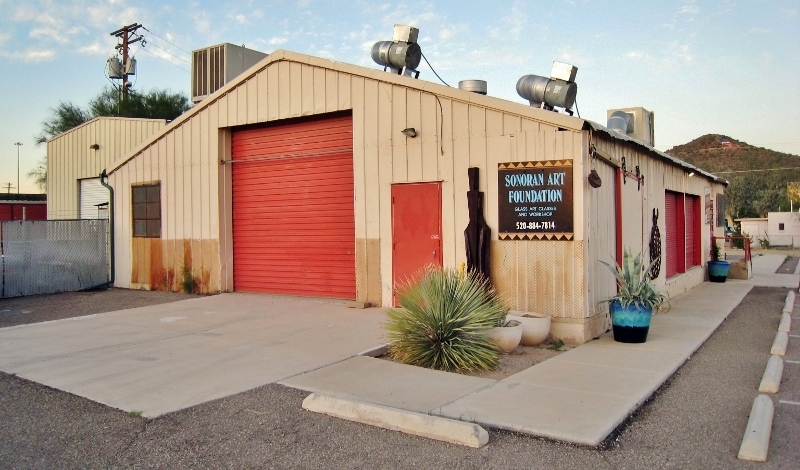 Sonoran Glass School is open year-round. We welcome visitors to come explore our gallery and sculpture garden and to watch classes (call for class times). Our gallery displays various styles of glass art made by our faculty and students. Gallery sales support our non-profit organization. We also encourage you to try our Make Your Own Glass Art Experiences, popular with tourists and locals alike who are looking to spark their creative fire through a short daytime adventure. Stop by any time we’re open. We encourage you to call ahead and find out what time any demos/classes/events are taking place that day. We may even be able to arrange a short tour for your group (depending on staff availability). To learn more about us or arrange a group visit or experience, please call 520-884-7814. Monday-Friday | 9:00 a.m.-5:00 p.m.
We are open to public on weekends when a class is in session, but phone calls may not be answered due to limited staff. Call 520-884-7814 during the week when planning a weekend visit to SGS or check the class calendar. Hours subject to change due to events and class schedules. Take Exit 259 (29th-22nd Street) and stay on the northbound frontage road along the east side of the interstate. Once you pass the traffic light at the 22nd street intersection, stay on the frontage road and turn right on 18th Street. We are on the south side of 18th Street. Take Exit 259 (22nd Street) and turn left onto 22nd from the off-ramp. While in the freeway underpass, immediately get into the left turn lane. Turn left to head north on the frontage road. Turn right on 18th Street. We are immediately on the right. Drive south on Stone Avenue. Turn right on 18th Street. We are at the west end of 18th Street, on the left before it dead ends into the freeway.